I’m Carrie Murphy, CD(DONA). I provide birth doula services. I’ve always been interested in and passionate about pregnancy, birth, babies, and reproductive health. After I finished graduate school in 2011, I decided to become a doula. I wanted to support pregnant people and their families in feeling calm and confident about their birthing and parenting choices and experiences. I believe that every birthing person has an inner source of courage, strength, and intuition— it’s an absolute honor to witness and hold space for them during this life-changing transition. Read more about my approach to doula work here. I completed my DONA-approved doula training in June 2012 and attended my first two births that year. I became certified as a birth doula through DONA International in January 2014. I re-certified in January 2017. Since 2012, I’ve attended over 60 births in New Mexico, Virginia, and Washington DC. In 2018, I gave birth for the first time myself! I am enjoying being a mother to my baby son. I support births in all settings (hospital, birth center, home) and have experience with vaginal birth after cesarean, planned cesarean birth, medically-complicated and high-risk pregnancies, and more. Supporting diverse families, like single parents and LGBTQI people, is important to me. Since I had my son, I am taking a much more limited client load for births, to ensure I have the time/energy to fully devote to each client. 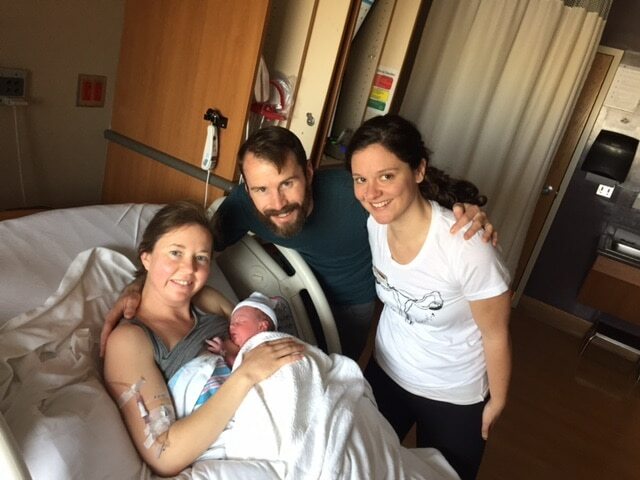 I am both a birth and a postpartum doula, so I provide support during pregnancy and labor, as well as in the first few weeks after the baby is born. You can hire me as both, or either one. I’m originally from Baltimore, MD, but I love everything about living in New Mexico, especially being a doula here. In addition to my doula work, I love hiking the Sandias, eating green chile chicken enchiladas, watching the Great British Baking Show, cuddling my dachshunds, and soaking in hot springs all over NM. I am also certified as a placenta specialist through the Assocation of Placenta Preparation Arts. I was the first APPA-certified placenta specialist in the state of New Mexico. I am a co-founder and volunteer coordinator of the UNM Volunteer Birth Companion program, a member of the steering committee for the New Mexico Doula Association and am a current HealthConnectOne Birth Equity Leadership Academy Leader. I am a former member-at-large on the board of the New Mexico Breastfeeding Task Force.